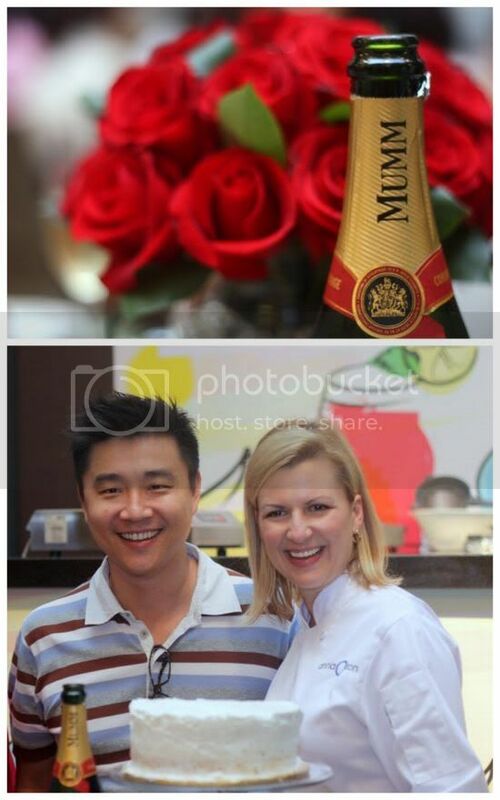 Recently, Kuala Lumpur got treated to a big sweet treat in the form of television celebrity chef Anna Olson who visited our shores. 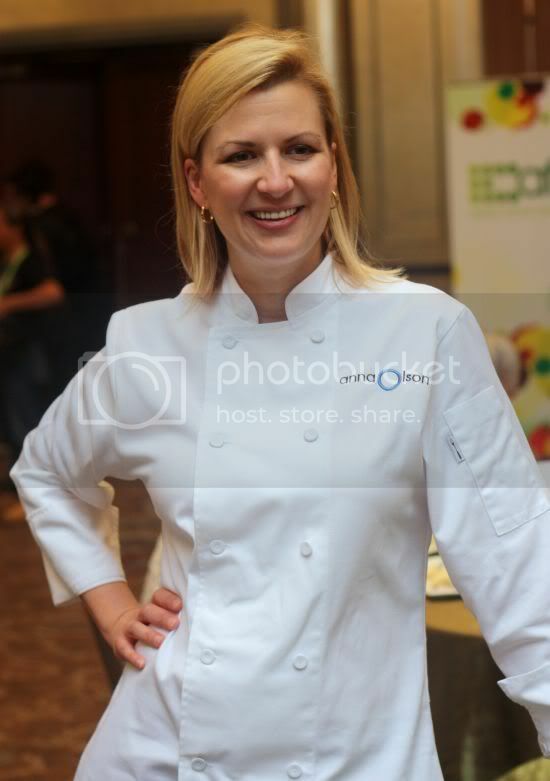 She was brought in by AFC, which airs her two shows: Sugar and Fresh with Anna Olson. A series of events were held for fans to meet their sugar goddess: a media event on Thursday where she prepped up maple ice cream, apple cheddar muffins and butter tart for the press, and lunches on Saturday and Sunday that saw participants dine from dishes prepped from her recipes together with GH Mumm champagne and where she demonstrated lady baltimore cake, banana caramel cheesecake and cappuccino nanaimo bars. Last but not least Astro held under event at Electrolux where fans got to see her baking up her banana caramel cheesecake. She's left Kuala Lumpur now for Phillipines, where she'll also be doing more appearances and cooking demonstrations. (Her Asian tour started in Singapore first before coming to KL). Prior to our lunch, Anna demonstrates the three desserts while we sipped on our GH Mumm champagne. Similar to how she runs the Fresh episodes on television, she asks us to imagine that it's her dinner party that she's throwing. Incidentally kudos to the AFC team again, as they also scored Fresh with Anna Olson cookbooks for the fans to purchase. We were lucky batch as the book sales did so well, there weren't any left for the Sunday crowd to buy. 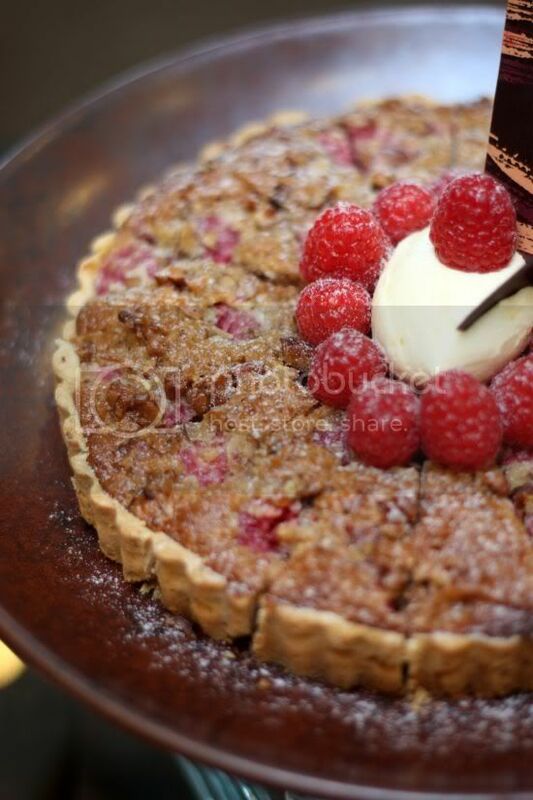 One of the items served for lunch is also in the cookbook. Anna is wonderful on stage, regaling us with stories while she iced a cake (her fav toy is the offset spatula as she shows all of us), beats up the cheesecake mixture, dribbled chocolate and caramel sauce and etc. I especially liked the caramel disaster story since I'm a little scared of that sauce even though it may appear simple. She tried a few times with it being too solid hard or even too flowing it refused to stay on top of the cake, and when she thought she had aced the perfect chocolate caramel cake, Anna discovers while cutting the cake, she had forgotten to remove the cake's baking paper layers! Anna also shares that in television, they often create scenes that can get all our senses tingling like the caramel and chocolate....the perfect tools to make us go ooooh and aaah. Hence when she dribbled that luscious amber caramel on the cheesecake, even though she cued us to all go "ooooh", it wasn't too hard as one can completely imagine how wonderful it'll taste eventually (and it did!). She also took questions from the floor such as baking quandrums and even shared with us how she loves durian. Hian Goh had taken her to try the D24 durian in Singapore. Another items she absolutely loves is coconut so she's planning to bring back some kaya. After the demonstration, lunch was served. 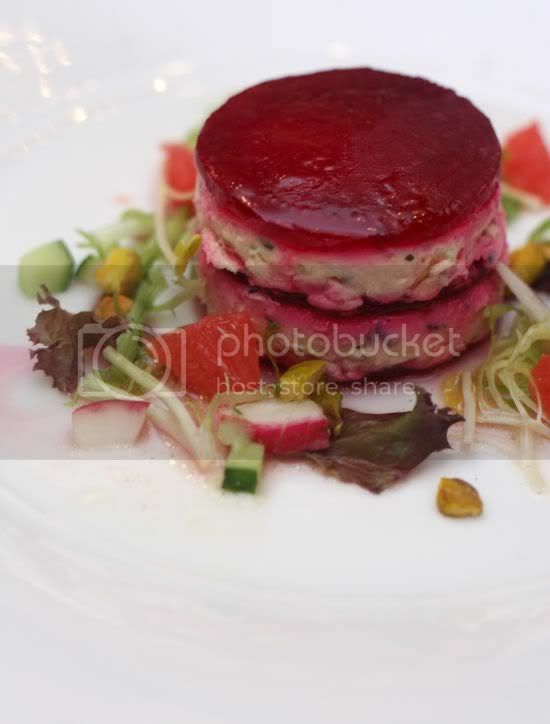 The beet with goat cheese terrine served with grapefruit and pisatchio is striking in pink. Not a dish for everyone though as some didn't quite enjoy the creamy (and pungent) cheese. The first course was a choice between seafood in parchment parcels or mushroom bisque under a puff pastry hat. Anna said she wanted to create wonderful smells for this dish especially when you break open the paper or crack through that puffed lid. 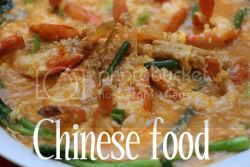 The seafood is light tasting with a generous amount of scallops and prawns on a bed of onions and vegetables. 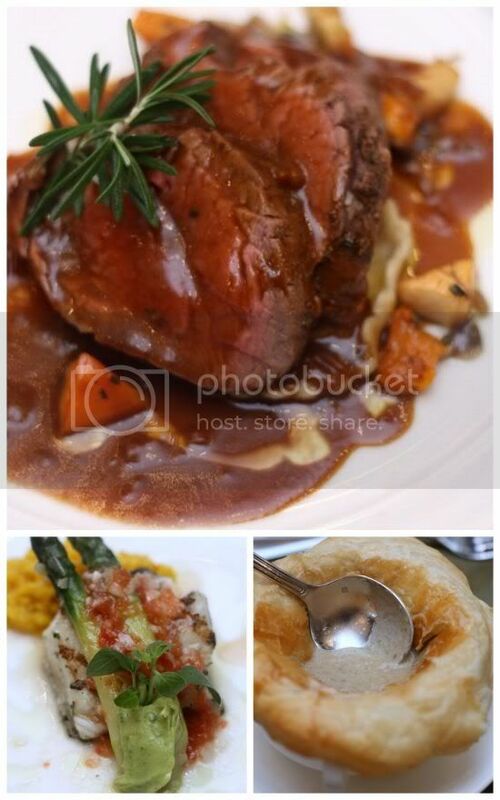 Main course saw a choice of slow roasted beef tenderloin served with maple onion cream, potato perogies and roasted root vegetables, and grilled cod with tomato vinaigrette with lemon risotto and asparagus with avocado cilantro "butter". The perogies (a dumpling stuffed with mashed potatoes) is one of Anna's family recipes as she used to prepare this with her grandmother. I kinda suspect her avocado cilantro "butter" for the fish is her take in getting a creamy sauce (minus the butter) by emulsion. There's a similar recipe in her cookbook where she creates a smooth tomato cream by emulsion with oil, a trick she writes that she discovered from her husband Michael. After the heavy but wonderful meal, it was the cheese course - a walnut, fig and brie tart with a frisee salad. 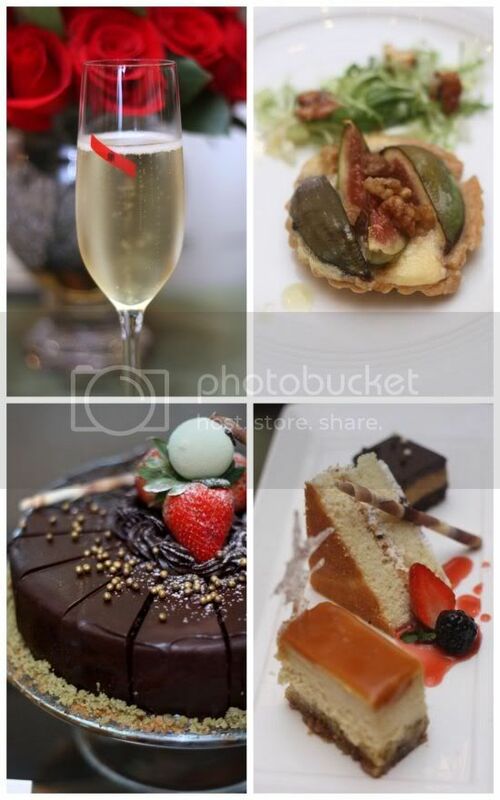 Last but not least, it was the trio of desserts. I loved the cheesecake since the whole combination of the oatmeal crust with bananas, caramel and smooth creamy cheese was so decadent. Anna had also demonstrated the cappuccino nanaimo bars that is the third most popular dessert in Canada (first is the butter tarts she did for the media event and second is date squares). A layered dessert - you start with a chocolate biscuit crust which also has grated coconut and toasted walnuts, a coffee layer that was very fragrant but too sweet for me followed with a chocolate layer. The lady baltimore cake sounded wonderful but strangely enough it tasted quite ordinary - a chiffon cake with a 7-minute light meringue icing with a chopped figs, dates, pecans and cherries layer. 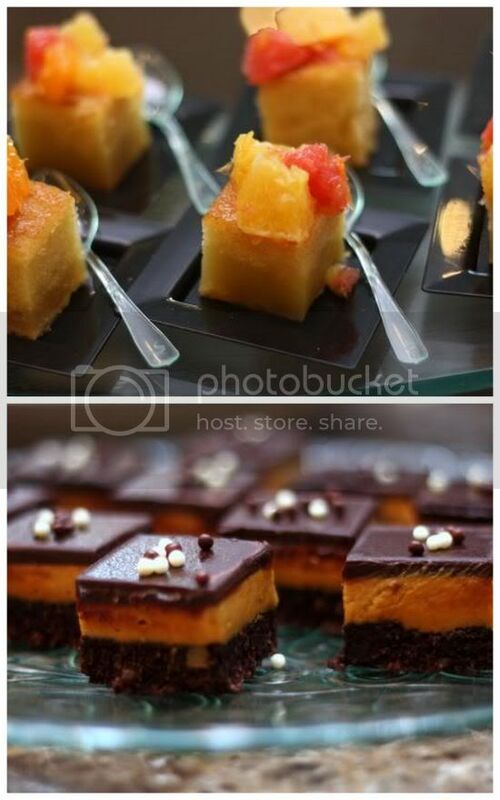 Most of the audience was surprised with more desserts at a specially set dessert buffet - coconut creme caramel, raspberry pecan tart, lemon olive oil cake with citrus and cream, cashew cookie selection and chocolate mousse torte. Since pictures will always be taken at dinner parties, Anna gave tips on how to pose (without looking like you had a super calorie laden meal!). She subsequently introduced her husband Michael to the audience, where he also demonstrated how he has learnt to pose (vs the slouch!). 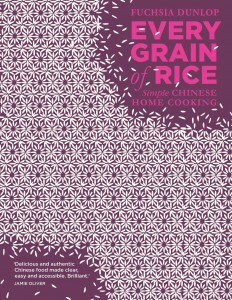 The event ended with a cookbook signing where fans (including me!) got to have a few words with Anna and get their books personalised with her autograph. I thought I'll share with you the cheesecake recipe she demonstrated as that was my favourite item I tasted. What I like is the unusual banana layer above the crust that gives it a subtle taste. Anna explains that to prevent the cheesecake from cracking, she lowers the heat during the baking and allows it to cool down before she chills it. Give it a try and discover its own awesomeness. For more pictures of the whole event, see the Flickr set. Thanks to GH Mumm Champagne for the invitation. Preheat oven to 180 degrees Celsius. Grease the bottom of a 23cm springform pan and wrap the outside of the pan in foil. To prepare the crust: In a food processor, pulse oatmeal cookies with pecans to an even crumble. Add melted butter and pulse to combine. Press into the bottom of prepared springform pan (not up the sides) and bake for 12 minutes. Allow to cool while preparing bananas. To prepare the bananas: Heat a saute pan over medium-high heat. Add butter and brown sugar, stirring until melted and bubbling. Stir in the rum or lemon juice and add bananas. Stir just to coat and warm. Pour into cooled crust. To prepare cheesecake: Beat the cream cheese until fluffy, scraping down the sides of the bowl often. Add sugar in 2 additions, beating well after each addition. Beat in butter and vanilla bean seeds. Add eggs, one at a time, beating well after each addition. Pour the cheesecake batter over the caramelsied banana layer in springform pan. Place springform pan into a baking dish and pour hot tap water around it to come halfway up the pan. Bake for 30 minutes, then reduce oven temperature to 160 degrees Celsius and bake for another 30-40 minutes, until filling puffs up slightly around the edges but still moves a little in the centre when shaken. 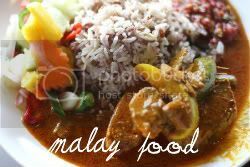 Remove the pan from water and allow to cool for 2 hours before refrigerating overnight. To prepare caramel topping: Combine sugar, water and corn syrup or lemon juice in a pot. Bring to a boil without stirring and cook, uncovered until it turns a rich amber colour. While cooking, occassionally brush down the sides of the pot with a brush dipped in cool water. Once sugar has reached desired colour, about 7 minutes, remove from the heat and carefully stir in whipping cream (watch out for the steam and bubbling). Return to medium heat and simmer until reduced y a third, stirring occasionally, about 5 minutes. Chill until thickened but still fluid about 15 minutes. 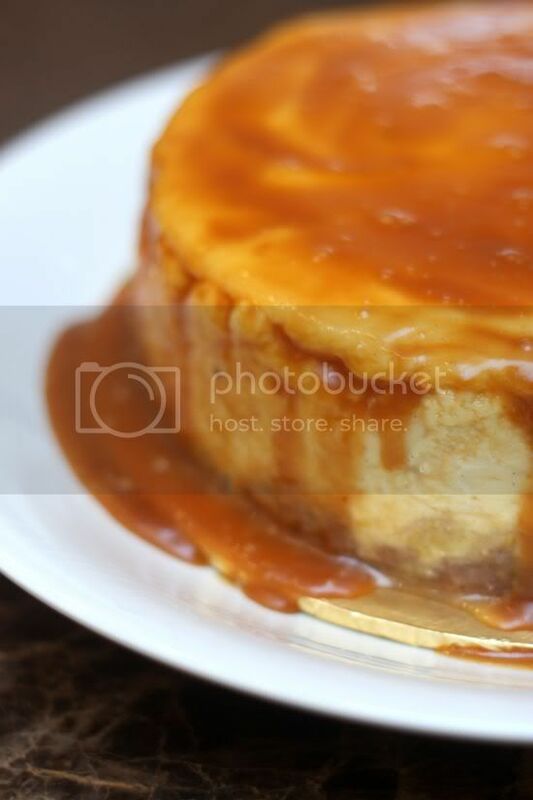 Pour caramel over cheesecake and chill completely. This can be done up to 8 hours before serving. To serve: Run a knife carefully along the inside of the pan to loosen, remove pan and slice with a hot dry knife. wow, looks like quite a spread. actually it was quite good value for money if you ask me, RM330 for free flow mumm, and lunch, and demo. i like her caramel banana cheesecake. surprisingly, it wasnt too sweet.